The OSO (Old Sorting Office) Centre in Barnes (London) will host a Grand Black and White Piano Party on Tuesday September 23rd 2014 at 7.30pm. The OSO is now an Arts and Community Centre which hosts many interesting events, and it also contains a new addition in the shape of a beautiful Steinway grand piano with a celebrated history, generously donated by Susan Tod Boyd, whose late husband David Tod Boyd, was an esteemed musical director and conductor. The piano concert and new Steinway is the brainchild of assiduous and dedicated concert promoter and impresaria, Yvonne Evans. Yvonne is the director of Seven Star Concerts, a concert agency which essentially promotes Words and Music performances. She has been raising money for a new instrument over the past months and then fortuitously met Susan Tod Boyd, and the rest is history! 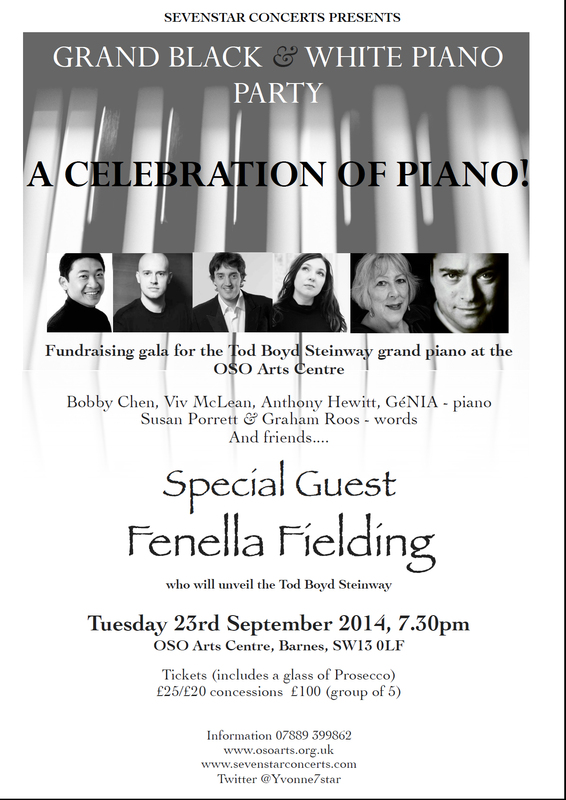 The ‘Tod Boyd Steinway’ was installed at the OSO centre during the Summer, after being restored by Michael Lewis, and was ready on 9th August for its first outing; a ‘Classic Gershwin’ evening of words and music, which was performed by actress Susan Porrett and pianist Viv McLean (Viv plays the Steinway in the photo above), to a full house. The piano has a particularly fascinating history. It has been played by such notable musicians as Ralph Vaughan Williams and Cecil Sharpe, and used to accompany Isolde Menges (one of the foremost violinists of the first half of the twentieth century) in practice for her various solo performances and with her Quartet and Quintet throughout the 1920s, 30s and 40s. It continued to be played by her son, David Tod Boyd, throughout his own impressive musical career ending up in the Opera School at the Royal College of Music from where he retired. The piano was originally bought new in 1906 by Harold Tod Boyd a pianist, choir master and composer. In 1920 he married Isolde Menges, and came to live in Castelnau shortly afterwards. Isolde Menges had studied with Leopold Auer and Carl Flesch in St. Petersburg. She had made her debut concert 1913 at Wigmore Hall and throughout the first half of the twentieth century worked with leading conductors and orchestras around the world. In 1938, her Quartet was one of the first to present the entire cycle of Beethoven Quartets. A major prize commemorates her at the Royal College of Music, where she was a professor up until 1969. The piano featured prominently throughout her musical life in her home in Barnes, where it has been enjoyed by the many musicians who passed through her professional and social circle. On this piano Vaughan Williams composed his second string quartet. Following Isolde’s death in 1976 it was left to her son, David Tod Boyd, who held musical director and conductor roles at the Carl Rosa Opera Company, ENO, West End Theatres, the National Theatre and the Royal College of Music. The piano is dedicated to the memory of David Tod Boyd. The Grand OSO Black and White Piano Party will assist in raising money for the ongoing maintenance and upkeep of the piano. 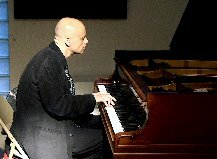 The concert features pianists Anthony Hewitt, Viv McLean, Bobby Chen, Génia, and Benet McLean, with words provided by Susan Porrett and Graham Roos. Fenella Fielding is the special guest who will unveil the piano. The programme is to include works by Schubert, Mendelssohn, Gershwin, and Chopin, and there will no doubt be a few surprises too!